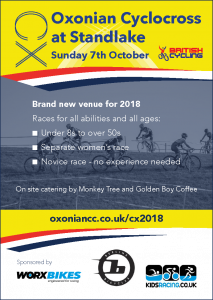 Oxonian CC is pleased to be promoting round 4 of the 2018 Wessex Cyclocross League on Sunday 7th October. This year we have a fantastic new venue near Standlake, a few miles west of Oxford. We’re very excited about the new venue, and we’ve planned what we think will be very interesting and challenging courses for all age groups. The full course mixes a number of wooded sections with a fast, open field. The wooded sections include technical single track, wider fast flowing tracks, a few “ride it if you can” ramps and a proper run up. The open sections are spiced up by a number of motocross/enduro features, including berms and “the whoops”. 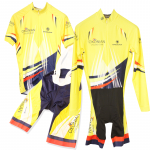 We are in need of helpers for the annual Cyclo Cross promotion to cover set up on Saturday 6th October, marshalling and take down on Sunday 7th October, the day of the event. If you can spare even just two hours on either day that would be a great help! If you are able to help please respond saying when you can be available (eg 8.00am to midday Sunday) to either David Jones Organiser or David Hanson (Chief Marshall on the day).